This could be from a number of reasons, but one of the main contributors is the lack of a simple, cost-effective solution that can connect all employees to one communication system, regardless of the device they use. This is why full team instant communication has become one of the most sought-after technologies for companies thriving in today’s ever-changing market. If you haven’t jumped on the team communications bandwagon yet, here are some of the reasons you need to look into these capabilities, as well as a look at the latest instant team communication innovation, Motorola WAVE™ OnCloud. Most departments do not work solely with themselves to accomplish their company’s goals. They rely on other departments and management to help get things done quickly and accurately. This can be delayed significantly if good team communications are not in use. Giving everyone the power of instantly communicating with the warehouse, the production line, the office, or even coworkers on the road, delivers better collaboration across the entire workforce. Remember the old saying - “Two Heads are Better Than One”. This adage remains just as true today as it was when it was first spoken, but in today’s world, we can use technology to get many more minds working towards one goal, no matter where those minds are located. Instant team communications can get an entire team together with the push of a button; letting anyone host a think-tank, anytime, anywhere! 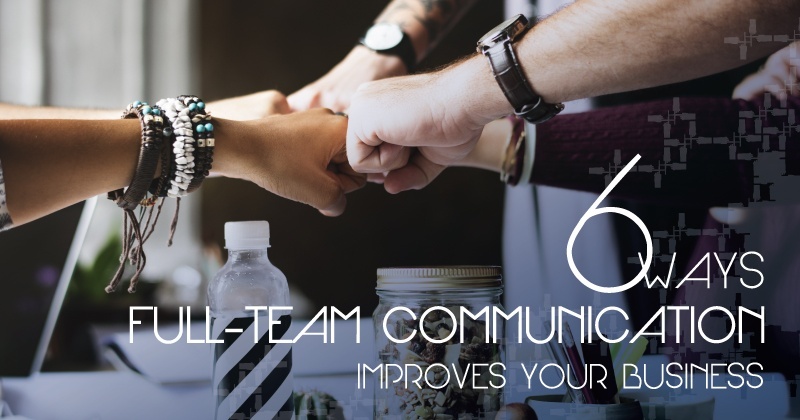 Team Communication gives employees a chance to be more connected across departments; bringing them closer together as one cohesive workforce. This transparency provides a view into the inner-workings of different departments and gives a greater understanding of how all the different components of the business come together to achieve it’s one main goal. Having an instant team communication system means employees can connect like never before. Office staff can instantly talk to the production floor, while the warehouse workers connect to the mobile fleet; building a greater understanding of one another and building camaraderie. It also reduces frustration by eliminating communication breakdowns in and between different departments. In order for a business to grow, it must evolve, and often times, it’s employees have the greatest ideas on where and how to make improvements. Providing an open team communication environment means they are more likely to share ideas with management. This open system also helps if any changes or restructuring needs to take place to accommodate growth, as employees will be able to get help, and settle in, quicker; making big changes seamless and less stressful. Team Communication systems have been around for a few years now, but the main problem companies have with them is the high cost of new equipment and expensive recurring fees. Motorola Solutions and WAVE have teamed up to deliver a new, cost-effective solution to this problem with the new WAVE OnCloud push-to-talk application. WAVE™ OnCloud is a broadband push-to-talk app that lets users utilize existing infrastructure to bridge the gap between cellular, computer, and two-way radio communications. It gives users the ability to send instant push-to-talk voice & text messages to any other WAVE™ OnCloud users on their company’s account. That means cellular users can now communicate with two-way radios with the push of a button; letting employees have all the benefits of instant team communication while using the device they need for maximum productivity. WAVE OnCloud software is compatible with Android and iOS devices. It only takes about 5 minutes to setup and is easy to use. A company administrator can add or remove users quickly with the password accessible user interface, making it easy to maintain. They can also use the location and tracking feature to know exactly where all users are located, both indoors and out. This technology is extremely cost-effective. There are no contracts that need to be signed, and monthly fees are based on the number of users, which can be easily scaled up or down, depending on what a business needs at any given time. It is a highly encrypted, cloud-based service, delivering the security of a private system for the lower cost of a shared one; just another way to make this technology an affordable option for all businesses. Motorola WAVE™ OnCloud is the instant team communication solution companies have been waiting for. It’s a simple, easy-to-use, cost-effective solution that delivers fully connected instant voice and messaging across all users, no matter where they are or what device they prefer to use. If you’re ready to take the next step towards full voice communications for your business, and start your FREE TRIAL of WAVE™ OnCloud, click the link below or give us a call, at 1-800-396-1911.